The Buddhas of Bamyan (Persian: but hay-e bamiyaan) were two 6th century monumental statues of standing buddhas carved into the side of a cliff in the Bamyan valley in the Hazarajat region of central Afghanistan, situated 230 km (143 miles) northwest of Kabul at an altitude of 2500 meters (8,202 ft). Built in 507, the larger in 554, the statues represented the classic blended style of Gandhara art. The lower parts of the statues’ arms were constructed from the same mud-straw mix while supported on wooden armatures. It is believed that the upper parts of their faces were made from great wooden masks or casts. The rows of holes that can be seen in photographs were spaces that held wooden pegs which served to stabilize the outer stucco. They were intentionally dynamited and destroyed in 2001 by the Taliban, on orders from leader Mullah Mohammed Omar, after the Taliban government declared that they were “idols” (which are forbidden under Sharia law). 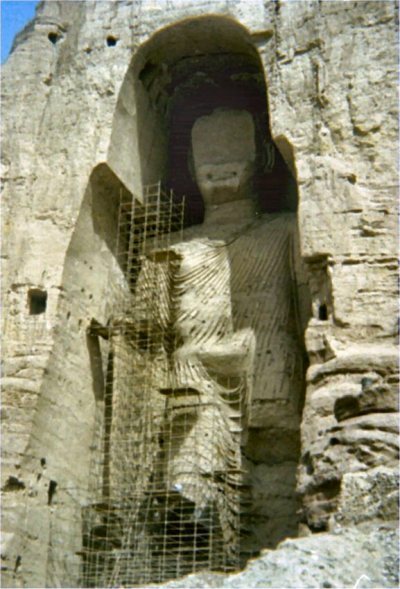 International opinion strongly condemned the destruction of the Buddhas, which was viewed as an example of the intolerance of the Taliban and of Islamism. Japan and Switzerland, among others, have pledged support for the rebuilding of the statues. Bamyan lies on the Silk Road which lies in the Hindu Kush mountain region, in the Bamiyan Valley. The Silk Road is a caravan route linking the markets of China with those of Western Asia. Until the 11th century, Bamyan was part of the kingdom of Gandhara. It was the site of several Buddhist monasteries, and a thriving center for religion, philosophy, and Indian art. It was a Buddhist religious site from the 2nd century up to the time of the Islamic invasion in the 9th century. Monks at the monasteries lived as hermits in small caves carved into the side of the Bamyan cliffs. Many of these monks embellished their caves with religious statuary and elaborate, brightly-colored frescoes. The two most prominent statues were the giant standing Buddhas Vairocana and Sakyamuni, identified by the different mudras performed, measuring 55 and 37 metres (180 and 121 feet) high respectively, the largest examples of standing Buddha carvings in the world. The larger figure was also said to portray D?pankara Buddha. They were perhaps the most famous cultural landmarks of the region, and the site was listed by UNESCO as a World Heritage Site along with the surrounding cultural landscape and archaeological remains of the Bamyan Valley. The smaller of the statues was built in 507, the larger in 554. They are believed to have been built by the Kushans, with the guidance of local Buddhist monks, at the heyday of their empire. The Chinese Buddhist pilgrim Xuanzang passed through the area around 630 and described Bamyan as a flourishing Buddhist center “with more than ten monasteries and more than a thousand monks”. He also noted that both Buddha figures were “decorated with gold and fine jewels” (Wriggins, 1995). Intriguingly, Xuanzang mentions a third, even larger, reclining statue of the Buddha. A monumental seated Buddha, similar in style to those at Bamyan, still exists in the Bingling Temple caves in China’s Gansu province. The destruction of the Bamyan Buddhas became a symbol of oppression and a rallying point for the freedom of religious expression. Despite the fact that most Afghans are now Muslim, they too had embraced their past and many were appalled by the destruction. The enormous Buddhas, the male Salsal (“light shines through the universe”) and the (smaller) female Shamama (“Queen Mother”), as they were called by the locals, did not fail to fire the imagination of Islamic writers in centuries past. The smaller Buddha was once known as a statue of Sakyamuni in Xuanzang’s Great Tang Records on the Western Regions, and physical characteristics of the Buddha has to be male. The larger statue reappears as the malevolent giant Salsal in medieval Turkish tales. When Mahmud of Ghazni attacked Afghanistan and part of west India in the 11th century, the physical destruction of the Buddhas and frescoes were beyond his capability. Therefore he looted Buddhist monasteries and stole other important artifacts. Nader Shah fired cannons at the statues, but it was beyond his capabilities to destroy them. Since then, the statues had remained largely untouched. 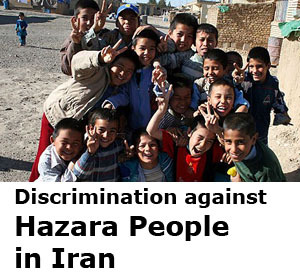 However, Afghanistan’s radical clerics began a campaign to crack down on “un-Islamic” segments of Afghan society. The Taliban soon banned all forms of imagery, music and sports, including television, in accordance with what they considered a strict interpretation of Islamic law. Information and Culture Minister Qadratullah Jamal told Associated Press of a decision by 400 religious clerics from across Afghanistan declaring the Buddhist statues against the tenets of Islam. “They came out with a consensus that the statues were against Islam,” said Jamal. According to UNESCO Director-General Koïchiro Matsuura, a meeting of ambassadors from the 54 member states of the Organisation of the Islamic Conference (OIC) was conducted. All OIC states – including Pakistan, Saudi Arabia and the United Arab Emirates, three countries that officially recognised the Taliban government – joined the protest to spare the monuments. A statement issued by the ministry of religious affairs of Taliban regime justified the destruction as being in accordance with Islamic law. Saudi Arabia and the United Arab Emirates later condemned the destruction as “savage”. Although India never recognised the Taliban regime in Afghanistan, New Delhi offered to arrange for the transfer of all the artifacts in question to India, “where they would be kept safely and preserved for all mankind.”, but these overtures were rejected by the Taliban. The statues were destroyed by dynamite over several weeks, starting on March 2 , carried out in different stages. Initially, the statues were fired at for several days using anti-aircraft guns and artillery. This caused severe damage, but did not obliterate them. Later, the Taliban placed anti-tank mines at the bottom of the niches, so that when fragments of rock broke off from artillery fire, the statues would receive additional destruction from particles that set off the mines. In the end, the Taliban lowered men down the cliff face and placed explosives into holes in the Buddhas. On 6 March 2001 The Times quoted Mullah Mohammed Omar as stating, “Muslims should be proud of smashing idols. It has given praise to God that we have destroyed them.” During a 13 March interview for Japan’s Mainichi Shimbun, Afghan Foreign Minister Wakil Ahmad Mutawakel stated that the destruction was anything but a retaliation against the international community for economic sanctions: “We are destroying the statues in accordance with Islamic law and it is purely a religious issue”. After one of the explosions failed to completely obliterate the face of one of the Buddhas, a rocket was launched which left a hole in the remains of the stone head. Though the figures of the two large Buddhas are almost completely destroyed, their outlines and some features are still recognizable within the recesses. It is also still possible for visitors to explore the monks’ caves and the passages which connect them. As part of the international effort to rebuild Afghanistan after the Taliban war, the Government of Japan and several other organizations, among them the Afghanistan Institute in Bubendorf, Switzerland, along with the ETH in Zurich, have committed to rebuilding, perhaps by anastylosis, the two largest Buddhas. In May 2002, a mountainside sculpture of the Buddha was carved out of a mountain in Sri Lanka. It was designed to closely resemble one of the Buddhas of Bamyan. The Afghan government has commissioned Japanese artist Hiro Yamagata to recreate the Bamyan Buddhas using fourteen laser systems to project the images of the Buddhas onto the cliff where they once stood. The laser systems will be solar and wind-powered. The project, which will cost an estimated $9 million, is currently pending UNESCO approval. If approved, the project is estimated to be completed by June 2012. In September 2005, Mawlawi Mohammed Islam Mohammadi, Taliban governor of Bamyan province at the time of the destruction and widely seen as responsible for its occurrence, was elected to the Afghan Parliament. 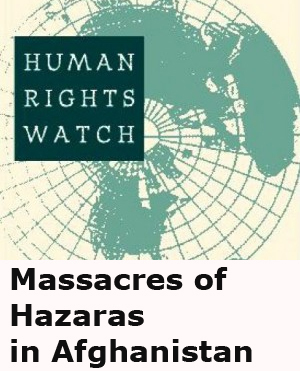 On 26 January 2007, he was assassinated in Kabul. Swiss filmmaker Christian Frei made a 95-minute documentary titled The Giant Buddhas (released in March 2006) on the statues, the international reactions to their destruction, and an overview of the controversy. The movie makes the controversial claim (quoting a local Afghan) that the destruction was ordered by Osama Bin Laden and that initially, Mullah Omar and the Afghans in Bamyan had opposed the destruction. In the summer of 2006, Afghan officials were deciding on the timetable for the re-construction of the statues. As they wait for the Afghan government and international community to decide when to rebuild them, a $1.3 million UNESCO-funded project is sorting out the chunks of clay and plaster — ranging from boulders weighing several tons to fragments the size of tennis balls — and sheltering them from the elements. The Buddhist remnants at Bamyan were included on the 2008 World Monuments Watch List of the 100 Most Endangered Sites by the World Monuments Fund. After the destruction of the Buddhas, 50 caves were revealed. In 12 of the caves wall paintings were discovered. In December 2004, Japanese researchers stated the wall paintings at Bamyan were painted between the 5th and the 9th centuries, rather than the 6th to 8th centuries, citing their analysis of radioactive isotopes contained in straw fibers found beneath the paintings. It is believed that the paintings were done by artists travelling on the Silk Road, the trade route between China and the West. Scientists from the National Research Institute for Cultural Properties in Tokyo (Japan), the Centre of Research and Restoration of the French Museums-CNRS (France), the Getty Conservation Institute (United States) and the ESRF (the European Synchrotron radiation facility) in Grenoble analysed samples from the paintings, typically less than 1 mm across. They discovered that the paint contained pigments such as vermilion (red mercury sulfide) and lead white (lead carbonate). These were mixed with a range of binders, including natural resins, gums (possibly animal skin glue or egg) and oils, probably derived from walnuts or poppies. Specifically, researchers identified drying oils from murals showing Buddhas in vermilion robes sitting cross-legged amid palm leaves and mythical creatures as being painted in the middle of the 7th century. It is believed that they are the oldest known surviving examples of oil painting, possibly predating oil painting in Europe by as much as six centuries. The discovery may lead to a reassessment of works in ancient ruins in Iran, China, Pakistan, Turkey and India. Initial suspicion that the oils might be attributable to contamination from fingers, as the touching of the painting is encouraged in Buddhist tradition; was dispelled by spectroscopy and chromatography giving an unambiguous signal for the intentional use of drying oils rather than contaminants. Oils were discovered underneath layers of paint, unlike surface contaminants. On 8 September 2008 archeologists searching for a legendary 300-meter statue at the site of the already dynamited Buddhas announced the discovery of an unknown 19-meter (62-foot) reclining Buddha, a pose representing Buddha’s passage into nirvana. ^ a b c Gall, Carlotta (2006-12-05). 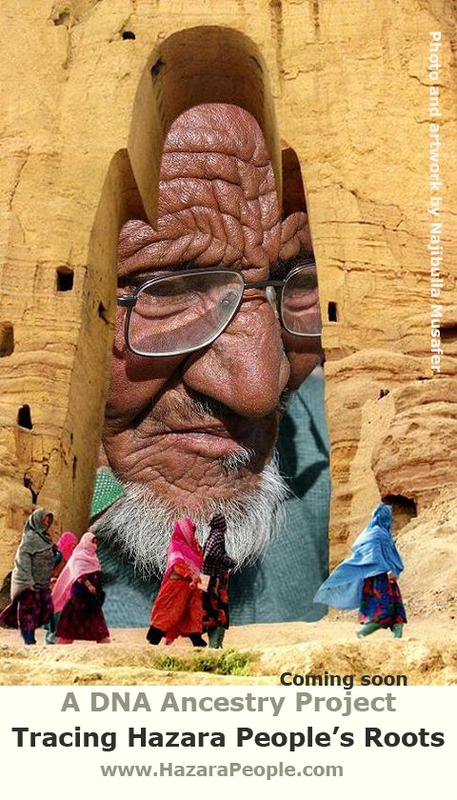 “Afghans consider rebuilding Bamyan Buddhas”. International Herald Tribune. http://www.iht.com/articles/2006/12/05/news/buddhas.php?page=1. Retrieved 2008-01-06. ^ Morgan, Kenneth W. The Path of the Buddha. Google Books. http://books.google.com/books?id=g6OHBCgmmGAC&pg=PA43&dq=Bamiyan+Buddha,+Gandhara+art&ei=PswlSqDBOILszATz2KH1Bg. Retrieved 02-06-2009. ^ a b Gall, Carlotta (2006-12-06). “From Ruins of Afghan Buddhas, a History Grows”. The New York Times. http://www.nytimes.com/2006/12/06/world/asia/06budd.html?pagewanted=2&_r=2&th&emc=th. Retrieved 2008-01-06. ^ Waduge, Shenali (2008-03-14). “Afghans destroy Buddhas, but cry foul over cartoons”. The Nation. 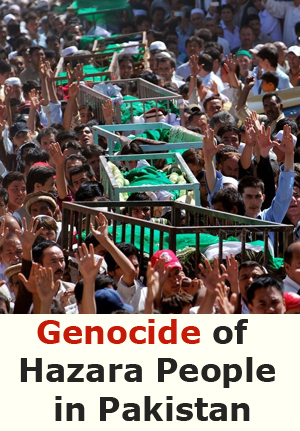 http://www.nationmultimedia.com/2008/03/14/opinion/opinion_30068112.php. Retrieved 2008-04-29. ^ “afghan_reaction.htm”. Institute-for-afghan-studies.org. http://www.institute-for-afghan-studies.org/History/NATIONAL%20TREASURES/statues_destroyed/afghan_reaction.htm. Retrieved 2009-12-06. ^ Harding, Luke (2001-03-03). “How the Buddha got his wounds”. London: The Guardian. Archived from the original on 2006-02-28. http://web.archive.org/web/20060228113747/http://www.guardian.co.uk/Archive/Article/0,4273,4145138,00.html. Retrieved 2008-03-23. ^ Vawda, Moulana Imraan. “The Destruction of Statues Displayed in an Islamic State”. Ask-Imam.com. http://www.islam.tc/ask-imam/view.php?q=3436. Retrieved 2008-01-06. ^ “World appeals to Taliban to stop destroying statues”. CNN. 2001-03-03. http://archives.cnn.com/2001/WORLD/asiapcf/central/03/03/afghan.buddhas.03/index.html. Retrieved 2008-01-06. ^ “Destruction of Giant Buddhas Confirmed”. AFP. 2001-03-12. http://www.beliefnet.com/story/70/story_7096_1.html. Retrieved 2008-01-06. ^ Bearak, Barry (2001-03-04). “Over World Protests, Taliban Are Destroying Ancient Buddhas”. The New York Times. 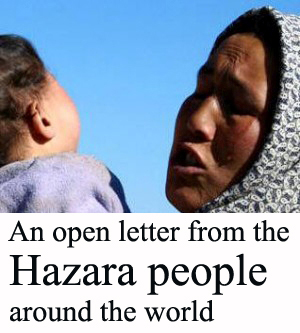 http://www.nytimes.com/2001/03/04/world/04AFGH.html?ex=1218686400&en=f513bb4edae409e0&ei=5070. Retrieved 2008-07-13. ^ “”Destruction and Rebuilding of the Bamyan Buddhas” by Slate Magazine”. http://www.slate.com/id/2104119/entry/2104187. ^ Crossette, Barbara (2001-03-19). “Taliban Explains Buddha Demolition”. The New York Times. http://www.nytimes.com/2001/03/19/world/19TALI.html?ex=1142571600&en=e5ba6c267eada53a&ei=5070. Retrieved 2008-01-06. ^ Kassaimah, Sahar (2001-01-12). “Afghani Ambassador Speaks At USC”. IslamOnline. http://www.islamonline.net/english/news/2001-03/13/article12.shtml. Retrieved 2008-01-06. 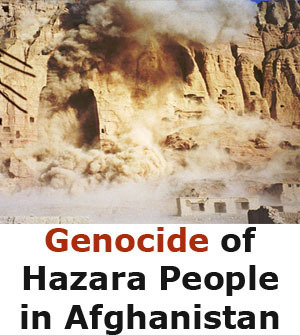 ^ “Laden ordered Bamyan Buddha destruction”. The Times of India. 2006-03-28. http://timesofindia.indiatimes.com/articleshow/1466974.cms. Retrieved 2008-01-06. ^ a b “Scientitsts discover first-ever oil paintings in Afghanistan”. Earthtimes.org. http://www.earthtimes.org/articles/show/200569,scientists-discover-first-ever-oil-paintings-in-afghanistan.html. Retrieved 24 April 2008. ^ “Ancient Buddhist Paintings From Bamyan Were Made Of Oil, Hundreds Of Years Before Technique Was ‘Invented’ In Europe”. Sciencedaily.com. http://www.sciencedaily.com/releases/2008/04/080422083309.htm. Retrieved 24 April 2008. ^ a b c d e “Ancient Buddhas painted in oils”. nature.com. http://www.nature.com/news/2008/080422/full/news.2008.770.html. Retrieved 24 April 2008.